The job application process generally involves two parts, the first of which is writing and sending an up to date, tailored CV and cover letter. Once a recruiter has read your application and deemed your skill set suitable for the role advertised, they’ll then instigate the second step; a formal interview. Once the actual interview day comes along, you’ll no doubt be feeling a mixture of emotions, from excitement and fear through to stress and anxiety. 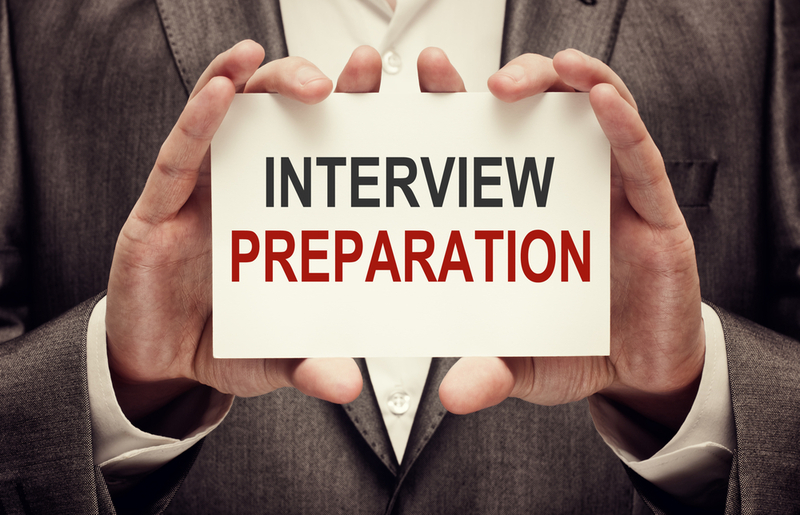 That’s why it’s vitally important that your pre-interview preparation is as thorough as possible. You’ve probably heard the quote, ‘By failing to prepare, you are preparing to fail’ and it’s true! So read through our pre-interview handy hints and give yourself the best possible chance to impress. As soon as you’ve secured an interview, it’s time to start researching! It’s absolutely vital that you do some homework before the interview so you have a good understanding of the business you’re hoping to join. The best place to start is the company website, but don’t forget to look at their social media channels too. Sites such as Facebook, Twitter, Instagram and Pinterest will also provide valuable insights. Thorough research will not only show the interviewer that you’re keen and motivated, it will also allow you to relate your skills and knowledge to those of the business. For example, your investigations may reveal that the company are planning to expand into a market you have experience in, which you can then mention at interview. Based on what you’ve discovered, it’s also a good idea to think of a few questions you can ask. If you’re unsure of what areas you need to be looking into, here are some suggestions to get you started: Organisational structure, mission, vision, values and philosophy, who their competition are, products and services and any recent media coverage. It’s also important to choose your outfit in advance and make sure it’s ready to go on the day of the interview. Dressing smartly will not only create a positive, professional impression, it will also make you feel confident, assured and ready for anything. In the days running up to your interview, get your suit or outfit dry cleaned, polish your shoes and iron a shirt or blouse. Anything you can do in advance that will reduce stress on the day of the interview has to be a good thing! Ultimately, what you decide to wear to an interview is down to you. Everybody has their own style of dress, but for a job interview, it’s a good idea to balance your personal style with a professional image and err on the conservative side. Your research will also help you decide on an outfit as you’ll have a better understanding of the company culture once you’ve looked into the business. You’ve done your research and sorted your outfit. Now it’s time to practice answering those all-important interview responses. You can never be 100% sure what questions will come your way, but it’s certain that you’ll be asked what qualifies you for the role. To prepare your reply, make a list of all the attributes from the job description and then write how you satisfy the criteria next to each point. You’ll then have a summary of your skills and experience that are specific to that job. Then it’s simply a matter of familiarising yourself with this information so you can relay it to the recruiter! The more specific you can be with your responses, the better. Using the STAR approach will allow you to structure your answers. RESULTS – What did you learn/achieve? If you’re driving, check the route, leave half an hour early in case of delays, find out about parking requirements, (is there ample parking onsite, will you need to pay?) and do a test run. If you’re using public transport, set off in plenty of time and check for any cancellations or delays in advance. Have a copy of the company’s telephone number in case you need to call and warn them that you’ll be late. Ten minutes early is the perfect time to arrive. If you arrive any earlier, wait nearby and use this time to practice your interview responses. You may not realise this, but your interview doesn’t begin when you sit down with the hiring manager; it starts as soon as you walk through the door. Be friendly and polite to the receptionist and anyone else you meet as the recruiter will often ask them for their first impressions of you. Receptionists generally have a great knowledge of the company culture and will have a good idea of whether or not someone will be a good fit for the business. Hopefully these tips will help you prepare thoroughly for an interview. The more research and planning you do, the more confident you’ll feel on the day. You’ll also feel less stressed and rushed, helping you to remain calm, collected and ready to impress!